Our Healthify Your Summer with Fage Total Greek Yogurt Series continues with the third recipe in the summer series and it's a personal favorite! Macaroni & Cheese is definitely a comfort food for me, and something I already know I would never be willing to give up, but I am definitely open to ways to make this favorite healthier and Fage did just that! A small substitution makes this recipe not only healthier, but sacrifices absolutely nothing in taste. It comes out just as creamy and delicious as you want your Mac & Cheese to be, I've already tried this recipe out on family and they had no idea there was a yogurt substitution in my recipe! So if your kiddos are Mac N Cheese lovers, here is a great way to sneak in some Yogurt and they won't be able to tell the difference (you can even sneak in some veggies!). FAGE (pronounced “fah-yeh”) is known for Total, the authentic Greek strained yogurt. This summer, Ascending Butterfly and FAGE Total takes you on a mouthwatering journey from plainly plain to plain extraordinary! Ƹ̵̡Ӝ̵̨̄Ʒ - Bring a pot of salted water to a boil. Add elbow macaroni and cook for 4 minutes. Drain and rinse with cold water to stop cooking. Ƹ̵̡Ӝ̵̨̄Ʒ - Warm the olive oil in a skillet over medium heat. Add onions and sauté for 3 minutes. Add red pepper and salt and continue cooking until vegetables soften. Remove from heat and reserve. Ƹ̵̡Ӝ̵̨̄Ʒ- Preheat oven to 350 degrees. Butter a 2 quart casserole. Ƹ̵̡Ӝ̵̨̄Ʒ - Melt butter in a medium saucepan. Add flour, stir and continue to cook for 2 minutes or so. Gradually whisk in warm milk and yogurt, whisking constantly to keep smooth. Add nutmeg. Bring to a low simmer and remove from heat. Stir in 10 ounces of cheddar cheese. Whisk until smooth. Add remaining 1/2 cup yogurt and Tabasco. 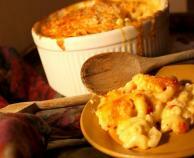 Combine macaroni, onion mix and cheese sauce and transfer to prepared casserole. Bake at 350 degrees for 30 minutes. Ƹ̵̡Ӝ̵̨̄Ʒ - Combine remaining cheddar cheese, feta and bread crumbs. Remove casserole from oven and top with crumb/cheese mix. Return to oven for 15 minutes or until golden brown and bubbling. Want to connect with Fage? FTC Disclosure Information: I attended a hands on cooking session at the International Culinary Council as a guest of Fage Total Yogurt, I was taught how to make the recipes I am sharing on my blog, I am under no obligation to do so. This is a non-compensated post. This is a non-sponsored post. As someone who has shed 26 pounds via lifestyle changes, I love to share those tips and tricks with my readers. oh man that looks delicious!!! @Nancy - It is definitely delicious! @chichijunk - I'm thinking of another bowl full myself!